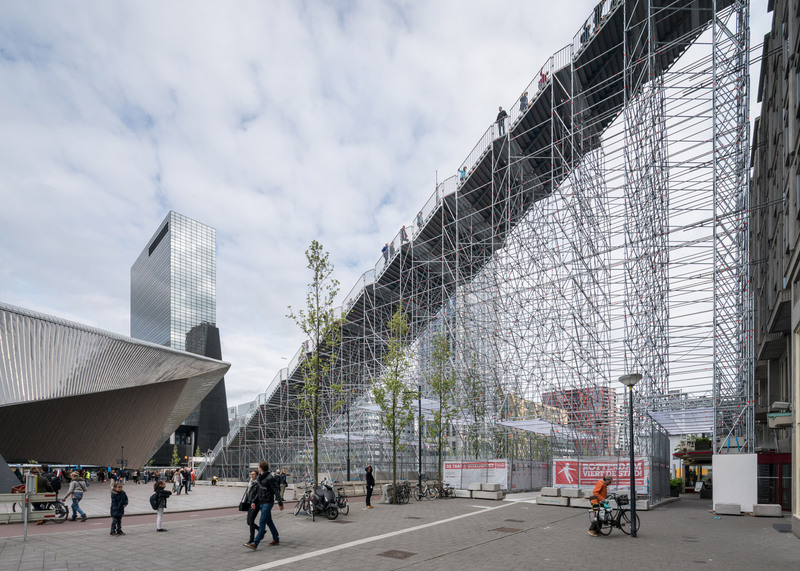 Dutch office MVRDV has revealed the first photographs of The Stairs, a huge scaffolding staircase leading up to the roof of an office block in Rotterdam city centre (+ slideshow). 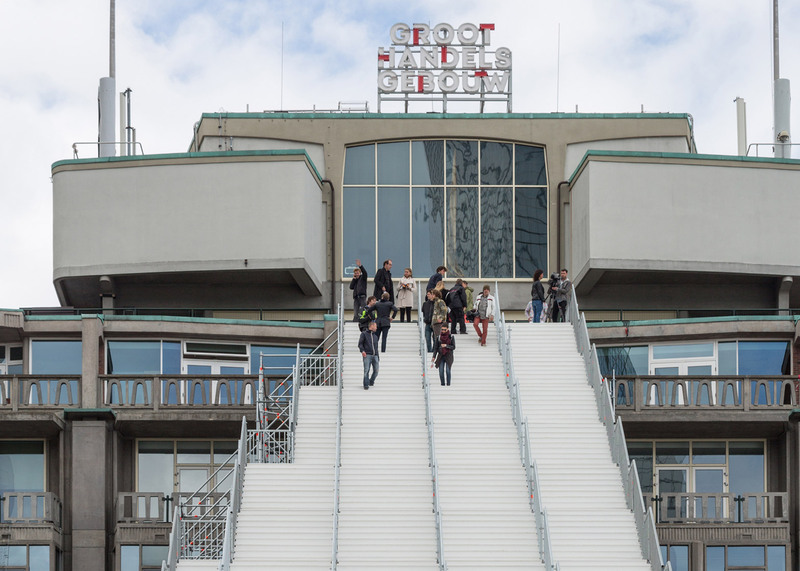 As the latest of several exciting new additions to the city, the temporary installation allows visitors to climb 180 steps up to the roof of the Groot Handelsgebouw – one of the first buildings constructed in the city after the end of the second world war. 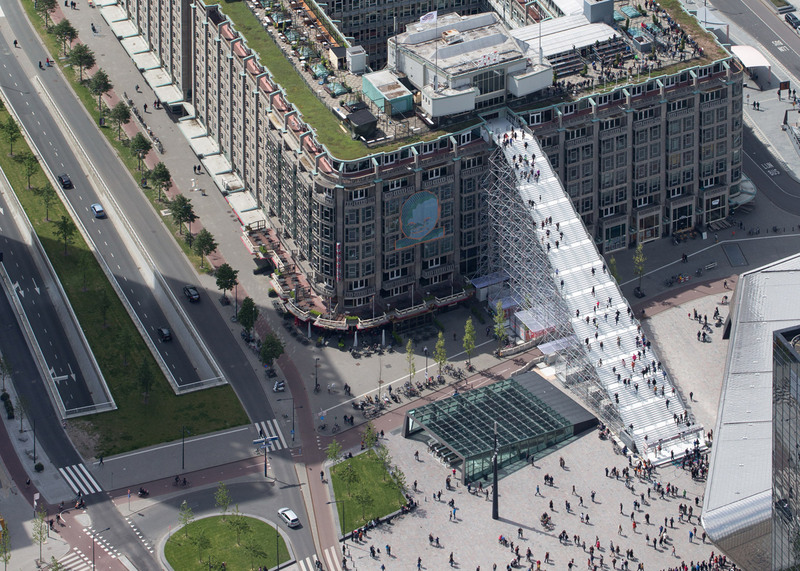 Measuring 29 metres high and 57 metres long, The Stairs leads up to a rooftop observation deck. Here, visitors will also find a venue for film screening and events, located inside the former 1960s Kriterion cinema. MVRDV co-founder Winy Maas believes the project is the first step in creating a new network of rooftop spaces around the city. "The stairs are a symbolic first step towards a better use of our city's second layer, and ideally would be replaced with a set of escalators in the next step," he said. 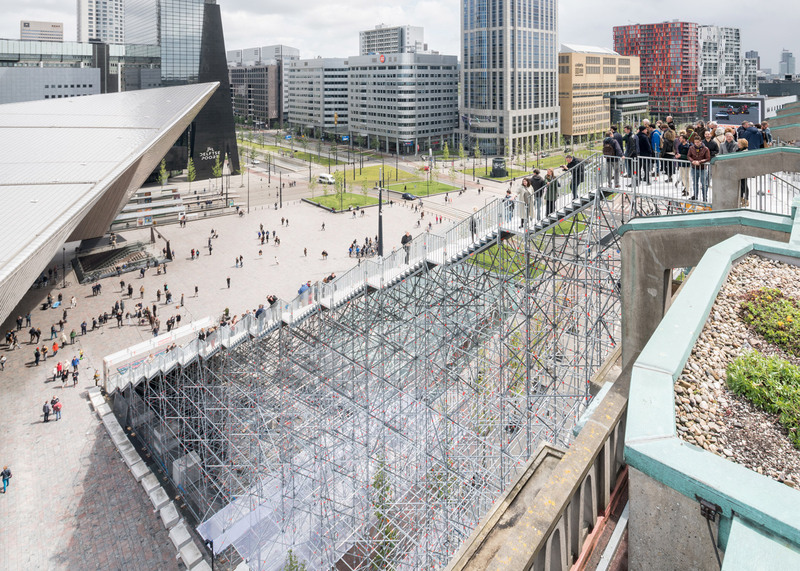 "It is, in this way, a second reconstruction, a 'Tweederopbouw', that gives access to, activates and connects the rooftops of Rotterdam." The project marks 75 years since Rotterdam began its post-war reconstruction and pays tribute to the radical architecture that has come about since, such as Piet Blom's Cube Houses, built in 1977, and Marcel Breuer's De Bijenkorf department store of 1957. 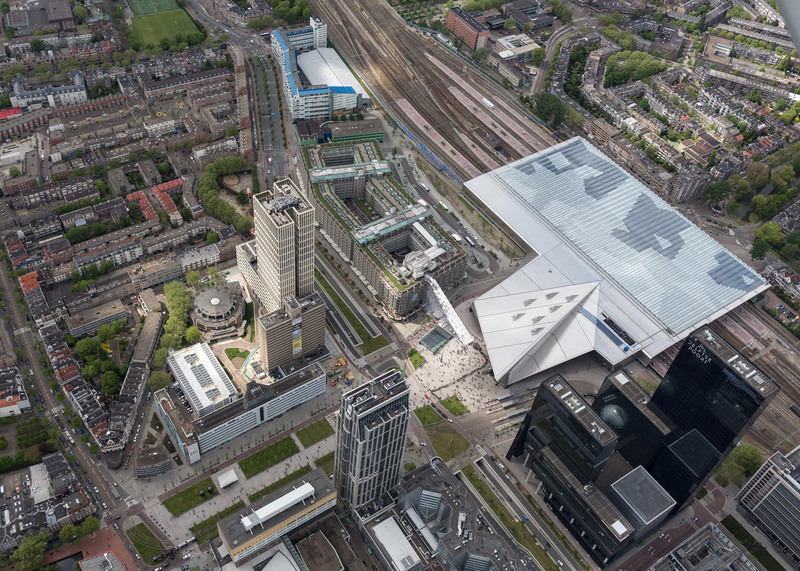 It follows on from a recent surge in architectural innovation in the city, with new projects including MVRDV's market hall and the OMA-designed De Rotterdam. An exhibition is being held alongside the installation, reimagining how other buildings in the city can accommodate rooftop activities. "With this installation and in our exhibition we show what this city could look like if we do that in many places, engaging a series of our existing buildings and giving access to their roofs, to create a new, much more interactive, three dimensional and denser urban topography for the next city generation," added Maas. 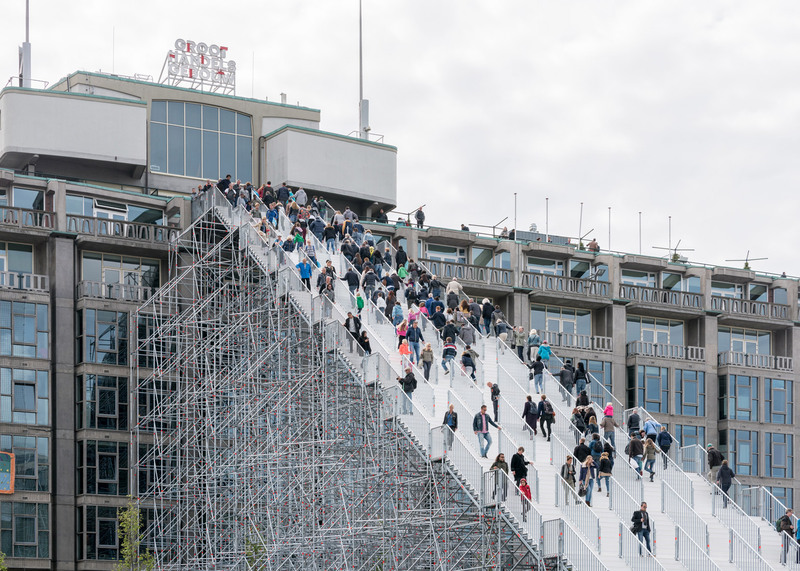 The Stairs was officially opened on 16 May 2016 by Rotterdam mayor Ahmed Aboutaleb and will remain in place until 12 June. It is located next to another of the city's new structures – the railway station by Benthem Crouwel, MVSA and West 8. It is also near the Lucht Café, which is offering refreshments to both tired climbers and casual observers.